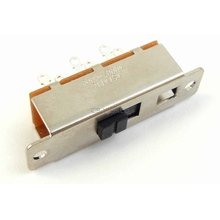 This is the internal push-to-talk switch for Astatic 636L CB microphones. This is an original factory replacement part, not an aftermarket knockoff! The switch is 1 7/8" long and 1/2" wide. There are 6 posts on the back for attaching wires. This part is compatible will all Astatic 636L microphones as well as Road King RK50 and RK56 microphones.